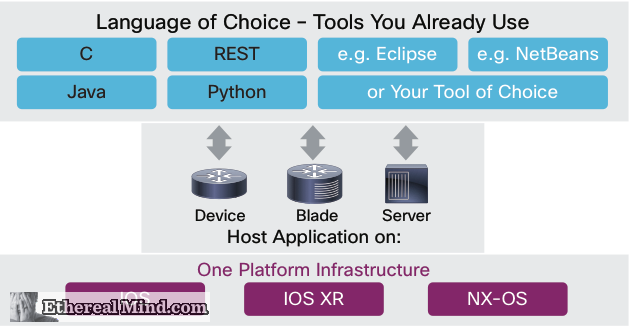 In this blog post, Frank Brockners ( part of the Get Your Build On team) gives a detailed and interesting look into Cisco’s SDN strategy and, specifically, provides some insights into the way that Cisco visualises OnePK as fitting into the market. 1. Networks are inherently physically distributed. Data Centre Networks aren’t but they are only one part of networking, there is still service providers, corporate WANs and others that need and want SDN type control and management. How do we provide solutions that address all of networking ? That said many of today’s network deployments are not that random, e.g. data center networks are often built using very few types of network elements and have a very regular and stable network topology. Would this allow us to re-consider our control plane architecture? Could we centralize parts of the forwarding control so we can adapt more easily to specific needs of a business or application? 2. There is value in distributed networking protocols of today because they act consistently and predictably. They have been proven over time to control loops and real life conditions. For who might still believe in full centralization, consider how difficult it is to debug the situation where “Routing” and “Forwarding” tables of a router become out of synch. 3. There might be value in the both centralised and distributed approaches. Some networks might needs specific solutions that suit and SDN might not be right for everyone. It is possible to build upon a network running a fully distributed routing protocol such as OSPF. On top this OSPF network, we could leverage a logically centralized routing application which reviews the link state database as computed by OSPF, and then computes and injects higher priority (least dollar cost or lowest delay) routes. And that is the (current) core of Cisco’s SDN strategy. To leverage existing protocols because they work and then layer SDN over the top of those systems. This means a fallback to our known and understood networking protocols while we make sense of how to utilise SDN in the future. There is some good info in this the PDF at ONE Platform Kit (onePK) for Developers in the Cisco Learning Network. At the moment, the future of SDN in the market is unclear. There are obviously point solutions in the data centre as Nicira showed recently but in terms of the overall network market outside of that market SDN is very unclear. You can take the view that Cisco doesn’t seem to know or comprehend how to implement SDN (as I sometimes do). Or that they are protecting their market position by using existing technologies and hardware (as Stacey at Gigaom seems to). Today I take the view, somewhat convincingly, that customers want the best of both worlds. The value of SDN in terms of control and operational efficiency and, at the same time, the reliability and predictability of current networks. CIO’s don’t want to be told to replace everything and start again – that’s would be unpopular, impractical and damaging to vendor brands. SDN needs to find a niche and prove itself as useful and reliable. Cisco sponsored the Packet Pushers to attend Cisco Live and record a number of podcasts as a commercial project which are publicly available at http://packetpushers.net. I also received briefings, met with executives etc etc. I didn’t get any t-shirts. Or anything else for that matter. My opinions are my own. Cisco Blog » Blog Archive » Distributed? Centralized? Both?.